The Evolution of the Production Privée Shan 27! It’s back and better than ever! The SHAN is Production Privees iconic bike. 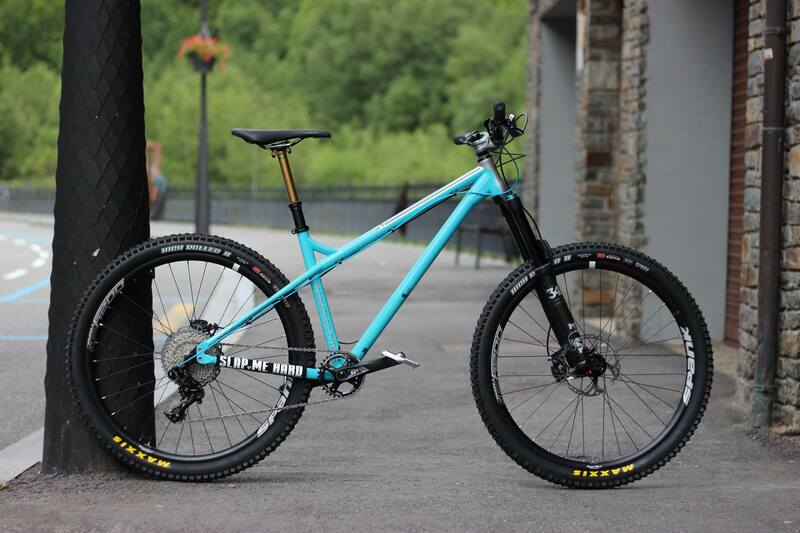 This is the best seller out of the range so far, their do-it-all bike, the wild child of their hardtail range! Being the simplest frame of the range it’s the ultimate Enduro Hardtail. The Production Privée Shan 27 Kremer is designed for speed, big days in the mountains, steep trails jumps and with the correct seat tube angle and stiff bottom bracket, it makes for great pedalling efficiency. It is at ease on any trail and is confidence-inspiring whether you are racing or on an all day epic with your mates. We can say this with confidence as we have raced the Shan 27 in DH races and Enduros and landing on the top step of the podium in every race it has entered bar one! It can keep up with your friends on their swanky carbon full sus bikes with ease. For the first time on the SHAN Production Privee have used their MCS SL tubes series. Developed from the original MCS tube series that first appeared on the OKA. This MCS SL version is a Japan-sourced material, triple-butted, heat-treated 4130 CrMo pushed to an ultimate level of performance with an optimized diameter, butted length and thickness. Compared to the MCS tubes, MCS SL saves about 100g in weight with added comfort and dynamism compared to former SHAN. David and Damien at Production Privee developed their own tube tooling for their both the seat and chain stays. The tubes are flattened in their centre part, allowing a slight vertical flex while maintaining an optimal level of lateral rigidity. The result? Better comfort on medium to large impacts, as well as far superior cornering and braking grip which is evidently noticeable. The Production Privée Shan 27 Kremer has stealth dropper post cable routing and it’s finally compatible with a water bottle holder. – Aggressive hardtail aimed at enduro and all-mountain riding. – Compatible with 27.5″ wheels. – Designed for a 140 to 160mm-travel fork. – Maximum recommended tire width is 2.5″.